First of all, the water in bottled water may actually be from a municipal source no matter how pretty the picture of a mountain stream on the label. But the most harmful element of bottled water is the bottle itself. Not only is discarded plastic an environmental disaster, it also leaches dangerous chemicals into whatever it touches. One notable example is bisphenol-A or BPA. This chemical is used in many plastic water bottles despite the fact this it is a known hormone disruptor that increases the risk for prostate and breast cancer as well as metabolic disorders. Drinking to excess has a number of health consequences, not the least of which is cancer. Numerous studies point to the link between alcohol and cancers of the esophagus, stomach, liver, colon, and breast. And though many consider red wine to be healthy due to its antioxidant content, it still contains ethanol. Ethanol is the primary trigger for cancer found in alcoholic beverages. The CDC recommends no more than one drink per day if you’re a woman and two drinks per day if you’re a man. Energy drinks may make you feel invincible for a few hours, but they are doing steady damage inside your body. For one thing, they are made primarily of sugar, caffeine, and artificial dyes, which can spike your blood pressure and blood sugar at the same time. People have died from drinking too many energy drinks, especially of heart problems and seizures. Anything that weakens the systems inside your body can leave the door open for cancer. Plus, sugar is cancer’s favorite food and too many energy drinks leave a lot of it available to feed those killer cells. There is a lot wrong with soda – it has no redeeming health value at all. Like energy drinks, it contains a ton of sugar, caffeine, and artificial ingredients. One of those chemical additives is a colorant called 4-MeI. It gives cola its brown color, but is also a known carcinogen. Regulations on the use of 4-Mel differ from place to place, but California at least requires that it be labeled as potentially cancer-causing on all food products that contain it. Diet soda has little to no “real” sugar, but instead contains a sugar substitute like sucralose, saccharin, or aspartame. These fake sugars are known to mess with your body’s metabolic processes, cause more fat to be stored, and potentially lead to diabetes and heart disease. They are also linked to cancers of the bladder and entire urinary tract. Here’s one that you probably naturally avoid, but the cancer agency of the World Health Organization, the IARC, has suggested that drinking very hot beverages can lead to throat cancer. To qualify, the drink must be at least 149 degrees Fahrenheit, and most people don’t enjoy their tea, coffee, or hot chocolate that scalding. The research centers primarily around a beverage called maté that is traditionally drunk at very hot temperatures in Asia, South America, and Africa. There is little risk from your standard hot beverage, but we do advise that you be patient while it cools to a safe temp – don’t take a big swig until you’re sure. Coffee in general is antioxidant and nutrient rich and offers some prevention against cancer. Unfortunately, some coffee-based beverages are more sugar and cream than actual coffee. Adding a bunch of syrup, chocolate, caramel, or whipped cream to your java pretty much undoes all the advantages you may have started with. For example, a 20-ounce white chocolate mocha, made with whole milk and topped with whipped cream, delivers a gut-busting 580 calories and 26 grams of fat. Regular consumption of rich coffee drinks can lead to obesity and diabetes on the way to cancer. “Juicing” is thought to be a healthy thing, and it can deliver some critical vitamins and minerals. However, much of the nutrition in whole fruits and vegetables is in the fiber (pulp) and skin. When you remove those, not only do you lose important nutrition, you also tend to consume a lot more because it’s the fiber that helps you feel full. Plus, fiber slows absorption so that your blood sugar doesn’t spike. Frequent consumption of juice has been linked to a greater incidence of rectal cancer, probably due to the high level of sugar in juice. 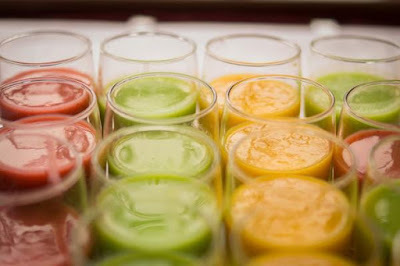 Some juices rival soda by this measure. Smoothies are a better choice than juice because all of that good fiber is retained, albeit partially “digested” in the blender. But always make your smoothies at home! There is a reason store bought smoothies taste so dessert-like and have a smooth, creamy texture – they add a lot of extra stuff that balloons the fat and sugar content. It’s the fact that this junk is hiding in a food we think of as healthy that’s at issue; it’s too easy to load up on unhealthy ingredients without even realizing it. Sports drinks may not directly lead to cancer, but they provide a stepping stone along the way. Though marketed as healthy, sports drinks are loaded with sugar and carbohydrates. And unless you literally work out all day long, they are unnecessary too. Stick to regular water for the most part, because the extra calories in sports drinks can lead to obesity and type 2 diabetes, both of which are linked with an increased risk of developing cancer. In the end, plain filtered water is best for your body. Other beverages are fine in moderation, but aim to get about 2 liters of water per day before drinking anything else (your morning coffee aside, of course). What you drink is just as important as what you eat in terms of cancer prevention, so don’t forget to note those liquid calories.